A Clipboard Manager allows you to copy texts, images or files to your clipboard. However, the conventional clipboard managers have some limitations. To overcome those limitations, we can use third-party Clipboard managers as they provide us more functionality. They can store history, provide security with encryption and much more. We are providing you the 7 Best Clipboard manager alternatives for Windows. Ditto is an effective extension for a Windows Clipboard. It saves all your texts, images, html formats and other information. All copied items can be accessed any time whenever you wish to retrieve them. The most important feature of Ditto is: it allows you to connect multiple computers across a network and you can sync your clips between them. All the synced data will be in encrypted form for security reasons. It supports all type of formats html formats, custom formats etc. ArsClip is a very simple clipboard manager due to its size. As the program does not require any installation, however there is an option if you wish to install it on your computer. It allows you to save images, text, HTML and Unicode. To get started you have to just click on it. It also allows you to take the screenshot of your Windows screen and you can save it. The main features of ArsClip are: Permanent Clips/Macros for copying and pasting automation, Win7 Jumplist support, Optional Clipboard Bar etc. Clipx is very common, fast and easy to use due to its size. It is very small program which supports text and images. It consists very useful plugins to give you more advanced functionality like color picker helps to automatically fill the color values to clipboard, clipboard search etc. It also recalls 1024 clips and purge automatically. The latest version of the program comes with x86. Copy Space is distinct from other clipboard programs. It is a app which is offered by Microsoft. You can download it from Windows app store. It is very dissimilar in interface and like other clipboard managers it doesn’t stay in system tray. When you open this app, it runs in the background. It consists various type of features. One of the main feature of the app is: it can sync over Google Drive. However, you have to pay to Microsoft to get this feature. M8 Free Clipboard includes Spartan Script language. It can save 14 permanent clips of you have copied. It allows you to save text, app shortcut and path of the URL. However, the newer version of the program does not include hotkey and macro clips. When you open the program, it lives in system tray. It also gives you the preview of the items you have copied on clipboard. It runs on all Windows platform from Windows XP to Windows 10. It has a very simple interface. 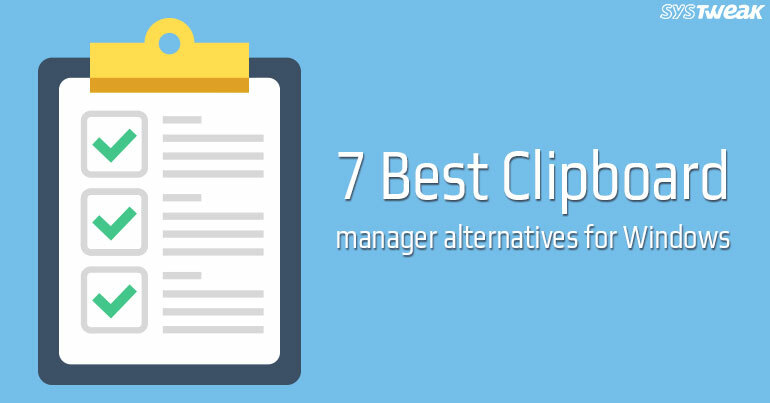 ClipClip is one of the best clipboard manager for Windows. It stores text, images, URL in the form of clips in an organized way. It has a very good interface which gives you a search bar at the top of the program window. When you open this program, it lives in system tray. You can retrieve it back from system tray to manage your clips. You can make a nested folder if you wish to make them. It also provides you an option to link your clips to your Google Drive. It also allows you to drag and drop the files, text, folder and images. It is 100% free to use. 1Clipboard has a very nice-looking interface and design. Like other clipboard managers, it saves text, images, URL etc. You have to just copy paste on it and you can access it from any device. It also works with Google Drive. When you open this program, you have to just perform a drag and drop operation to use it. It lives in system tray. It is a very simple and useful free tool. That’s all folks, I hope all above-mentioned Clipboard manager alternatives will help you to organize your content. If you have any comment or suggestion, you can write in section provided below.